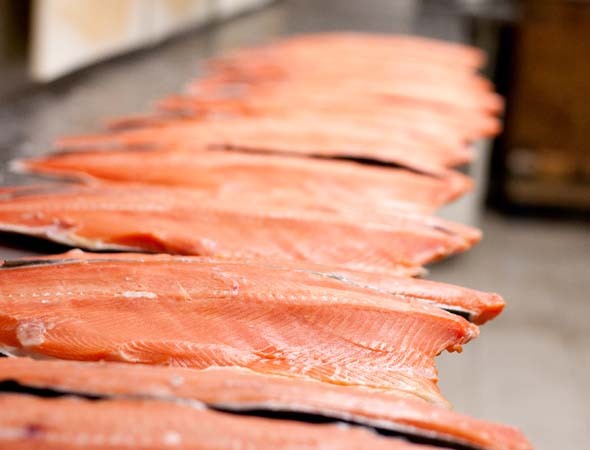 Kristapsons is known as the place to go for some of the best smoked salmon in Toronto. 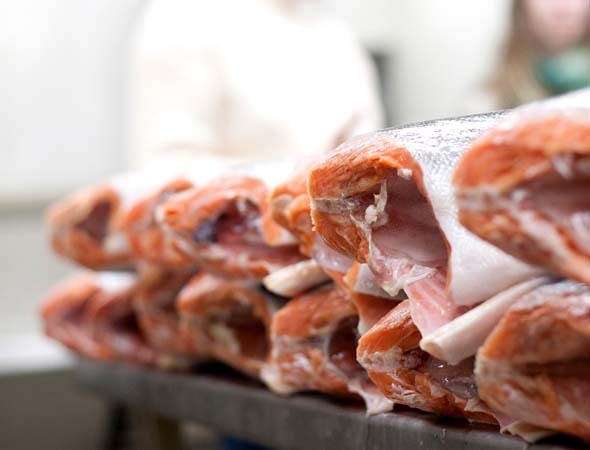 Prepared fresh and cold-smoked to boost omega-3 oils, this Leslieville shop has been a Toronto fixture since 1953. "Right out there," owner Andris Grinbergs says, sticking his head out the front door. He points across the street. "Right where that Holy Cow store is; you see, that was a dairy back then. And the cows would graze behind where those houses are." Grinbergs has a bit of a "great uncle" vibe about him, friendly and forthright in a pale ivory sweater and parted grey hair. 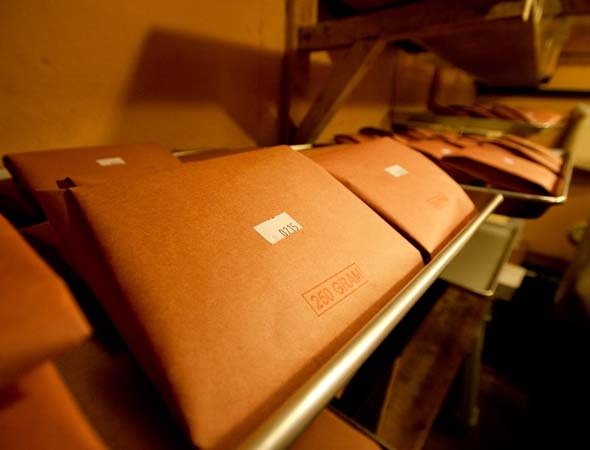 "With the dairy right there and the streetcars going along, Kristapson thought this would be the place for his butcher shop." 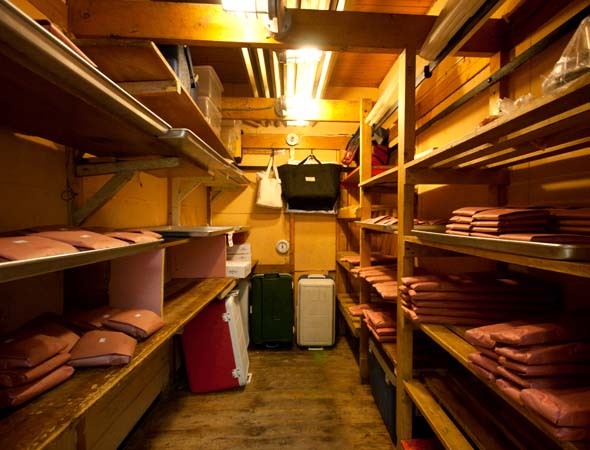 Adolfs Kristapson was a master butcher, Grinbergs tells me. Originally from Latvia, Kristapson made everything from his sausages and salamis to, yes, his smoked salmon, all by hand after opening in this space on Queen East in 1953. When mechanizing took hold, Kristapson couldn't compete with the diving prices, so he eventually narrowed his offerings to just summer salamis and smoked salmon. Then, in 1964 when he decided to get out of the business, Grinbergs' uncle, who was a real estate agent at the time, took it over. "In the late '60s," Grinbergs says as we stand in Kristapsons' storefront, "people were beginning to realize the health benefits of fish." 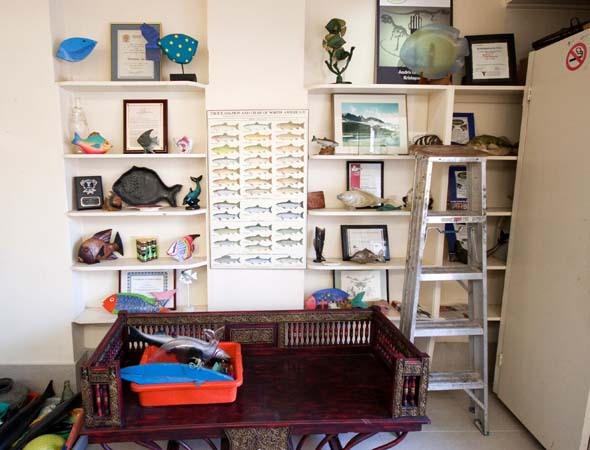 It seems Grinbergs has also realized the decorative possibilities of fish, as his entrance is decked out with fish clocks, an origami fish mobile, a fish bell, fish sculpture, and countless fish figurines. "Of course, then they didn't know much about omega-3 fatty acids," he says, snapping me back to reality. "Or the benefits for the brain, but they started realizing it was a healthy choice, so more and more people began buying it." It wasn't until 1988, after being stationed in Germany with the army in his younger years, then living in Florida and raising a family, that Grinbergs decided to move to Toronto to take over Kristapsons from his retiring uncle. "I was getting divorced and my son was going to university, so that was the right time for me to move up here," he says. Now he's on his 23rd year and it's clear he's immensely proud of the Kristapsons product. "All the work is done back here," he says, leading me to the back of the shop. 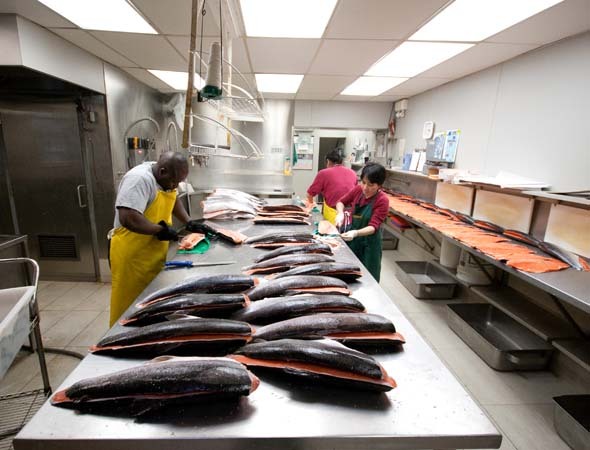 I braced myself for the unknowns of gutting fish, but to my surprise (and relief) it was all clean and orderly. No stray, outside-of-body beating hearts, in other words. 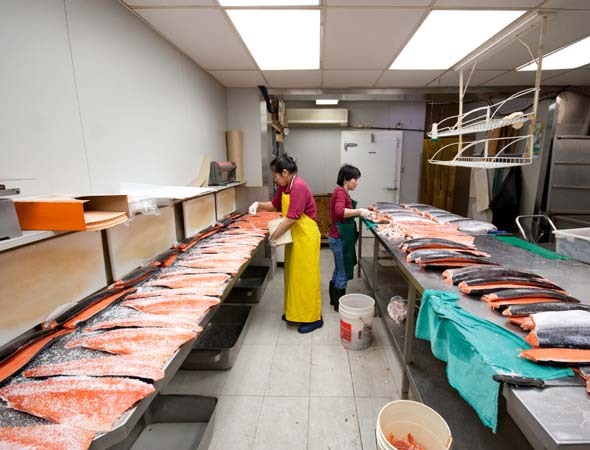 "We take a fish," Grinbergs says, gesturing towards about 30 large salmon sitting on a stainless steel table, "and cut them in half." "Then we remove the backbone, and add a coat of sugar which acts as an adhesive for the salt. Then the salt." 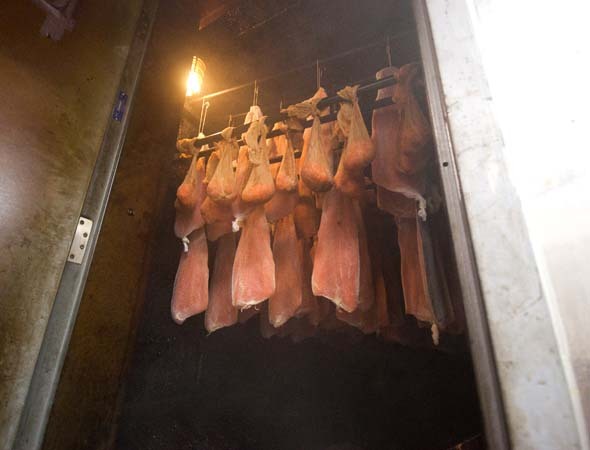 After curing for 24 hours, the fish is suspended on stockings in the flameless smoker, which Grinbergs opened to let me take a peak inside. 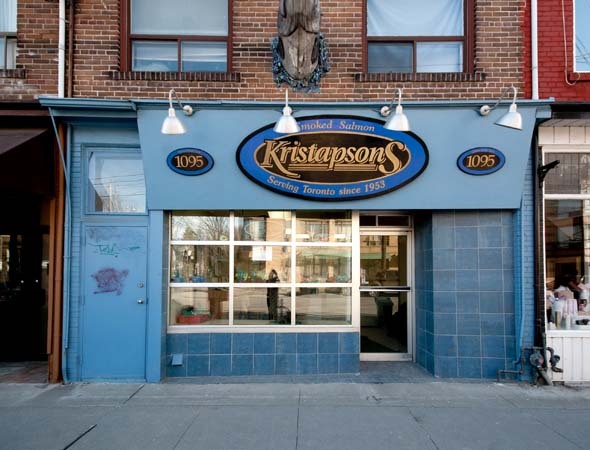 Along with this store, Kristapsons sells its 150g, 250g, and 500g parcels ($10, $18, $34 respectively) as well as its 1kg side ($60) at its Yonge Street location . It's best enjoyed, at least according to Grinbergs, "on sliced baguette, with a little bit of yogurt or sour cream, some horse radish, a little honey, then capers, and the fish on top. That's my favourite hors d'oeuvre."